HA HA HA! Here's a nice bat-treat for all you super-crazy serious BATMAN FANS out there! 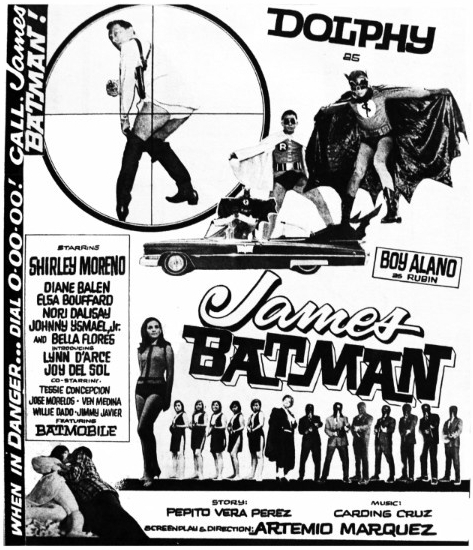 It looks like someone on Youtube uploaded a "Batman Film" that is pretty hard to find, JAMES BATMAN!! This was a bootleg movie made in the Philippines that has become a cult classic. It was made around the time of the 1966 BATMAN TV Series. I guess, to capitalize off it's fame. I recommend watching it with an open mind. I mean, it's not in English and you will have to follow a story line that is insane. I mean, it's SO super-cheesy! Oh yeah, if you want more in-depth information on this classic-cult film then please check out this WIKIPEDIA page.